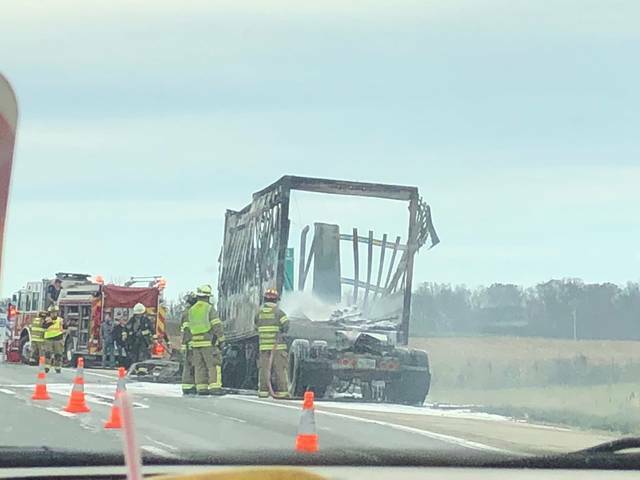 WAPAKONETA — A UPS driver had for minor injuries after his truck caught fire on Interstate 75 near Wapakoneta, Friday. According to Jonathan Coffey, trooper from the Ohio State Highway Patrol, Wapakoneta post, Darold Zink, 46, of Toledo was southbound on the interstate near the 106 mile marker at 1:06 p.m., when he heard an explosion under the hood of his truck and pulled off to the side. The engine compartment, the cab, and the entire truck then caught fire, causing the closure of the southbound lanes. The Wapakoneta Fire and EMS responded. By 1:44 p.m. one of the lanes was reopened. Zink refused treatment to an area hospital and was treated at the scene. The trailer part of the truck was empty at the time of the fire.